Best article today has to be the Daily Mail's in-depth examination of the popemobile complete with explanatory picture. Teachers might be able to compose some good physics problems from some of those data - weight 5 tons, 0-60 in 6 seconds, top speed 160mph. I wonder if Jeremy Clarkson will get to play with one of these vehicles. 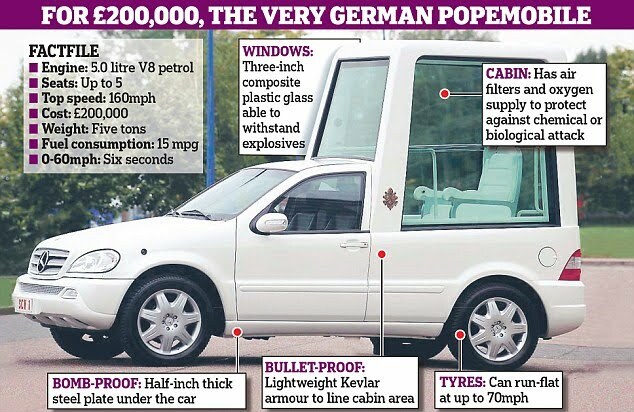 He could have an ecumenical dialogue afternoon at Brands Hatch where the Stig drives five tons' worth of popemobile at 100mph into the Archbishop of Canterbury's Vauxhall Corsa to see which comes off best - or something. On a more serious note, the respected John Allen writes: Benedict to step into buzz saw of dissent during upcoming UK visit. He also points out: "Secularism is famously Benedict’s bête noire, and he’s coming to the right place to engage it." He thinks that there is ground for hope because "any contact with Benedict at all usually improves his image, since the real man is inevitably less foreboding than the caricatures suggest." I think that is true, but for many ordinary people, the sheer weight of coverage, starting off with lovely pictures of the Pope and the Queen together, will trigger off popular enthusiasm despite all the metropolitan bile broadcast over recent days. Already the The Daily Mirror editorial has urged: Let Pope Benedict XVI's visit to Britain be a joyous trip. For those watching on television, here are links for the EWTN schedules in North America and in the UK. If you want to keep a closer eye on the media coverage, Catholic Voices Media Monitor is providing helpful updates and Protect the Pope continues its sterling work. The Diocese of Westminster diocese papal visit blog has lots of interesting news and pictures in preparation for Saturday's Mass. Channel 4 has a piece on Catholic priests on joining the priesthood with Southwark's very own Matt O'Gorman,a seminarian at the Venerable English College in Rome. And finally, in a Number 10 video, Prime Minister David Cameron says would like to offer Pope Benedict a very warm welcome to Britain - which is jolly nice.